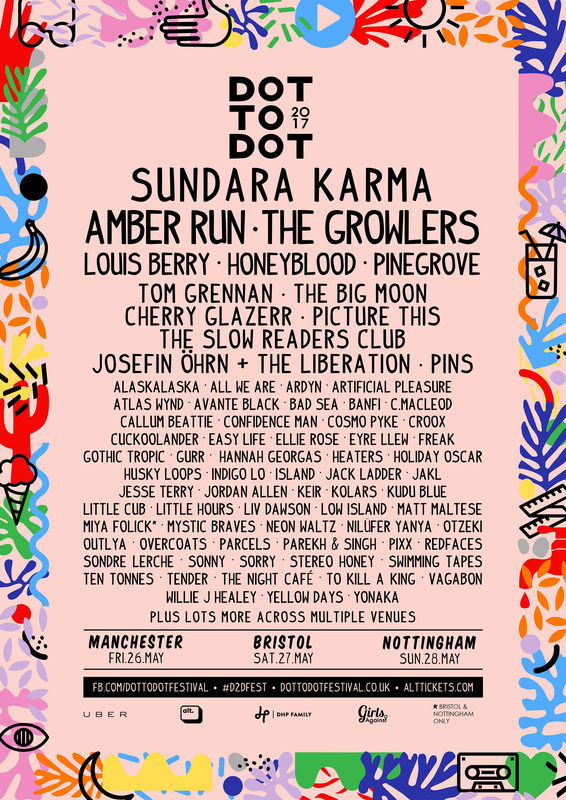 Dot to Dot holds a unique place in the often congested and identikit festival season by being a tightly organised, metropolitan music event which is held across two hundred miles minimising the necessity of travel to see your favourite band(s). For Popped Music we are going to focus on the Manchester event as that’s the one we are travelling to, but equally you could go to Bristol or Nottingham and have just as special a day. Indeed so impressed was one of the Popped team with last year’s event that they purchased a ticket as soon as the early bird tickets went on sale and without any clue as to who would be on the bill. The posters for the festival have come in two parts. The list of big hitters that you would expect headlined by old friends and permanent favourites of Popped Music, Sundara Karma and Amber Run. But in addition to that, each of the three dates has had their own “Supporting Manchester/Bristol/Nottingham Music” listing which covers the vast amount of bands from the local communities who are taking part in the event. The organisers, as well as wanting a good sized hometown backing, want to show people that this is not just an attempt to make money, but to give opportunities to bands who might not be expected to get a slot when a festival hits town usually. As you’d guess from your favourite new music blog, we are completely behind this. In support of that, Popped Music’s recommendations are going to come from both the big hitters list and the Manchester Music list too. And just because we haven’t recommended that you see the likes of PINS, Freak, Louis Berry, Honeyblood, or The Night Café, it isn’t because we don’t think you shouldn’t…. It’s because we already trust that they are going to be the kind of bands our readers are going to be aiming to see so we want to help you fill in the blanks in your schedule, or give you a left field choice when you’ve got a clash to you can feel safe in choosing neither of the bands you’d hoped to. These are one of the most exciting live acts I have seen in years. This band is normally listed as being psych, however after watching them perform I can comfortably say that you can put them into whatever pigeon-hole you so desire. Apart from quiet music. There is the visceral devastation available that you hope from a psych band, but the beats are so heavy and rapid that they could generate a moshpit at a moment’s notice, or leave you dancing and singing along. A staple of the Liverpool music scene for the last five or so years, All We Are offer some of the best pieces of summery, indie guitar pop that you could wish for. With harmonies, sweet vocals and a laidback style, it is not going to be the type of set that requires energy and commitment from the audience. Instead they are going to make you smile, grab a drink, and mark them on Spotify so that you can listen to them on your way home, whenever that may be. Most recently Cosmo Pyke crossed our path by way of a beautiful piece of Flying Vinyl and if the monthly musical mailstrom (sic) is not a good enough recommendation then take it from me that his funky, almost awkward take on pop with a vocal reminiscent of early Finlay Quaye is the kind of music that festivals are made for you to discover. During his earlier days, Cosmo was involved in a Frank Ocean music video; in years to come Frank Ocean might just be hoping to return the favour. Liam is a somewhat unassuming singer-songwriter that you can find so often at events such as this, however I have experienced previously the temptation that his voice brings. It can grab you as you walk past a pub at another metropolitan festival and force you to lie to a friend to explain why you’re going to be delayed for twenty minutes. I ended up stood at the front of the stage mesmerised by the wonderful northern simplicity in his tones. It was nothing groundbreaking, but when an act is one man and his guitar then it is a bit difficult to find a new route to take. But like the quickest walk possible home from work, it can be so satisfying when you get there. A big favourite of Popped Music for the way they can hold an audience with their high energy performances whilst at the same time holding a tune like a trusted piano. Hailing from nearby Stockport, I’m expecting a big audience and, if their performance for Popped Music at Threshold is anything to go by, that audience is going to go home very happy indeed.